Total PST Repair tool works like Outlook recovery software, with the help of this tool you can recover permanently deleted PST items (emails, contacts, etc..) & repair highly corrupted PST file. This software will help you to repair & extract data from corrupt state and save into PST, EML, MSG files. The PST recovery tool provides multiple features which are helpful to perform recovery of deleted items PST file/ files. With the help of this utility you can solve major & minor corruption of PST it will remove corruption & export data into new accessible PST. Software support Outlook 2016, 2013, 2010, and lower edition of Outlook email application and recovered their deleted data, it compatible with Windows 10 & lower editions. Total PST Repair software also provides some features like split PST option to divide large Output PST file into multiple parts, Date based filter option to export or save only selective data into PST. 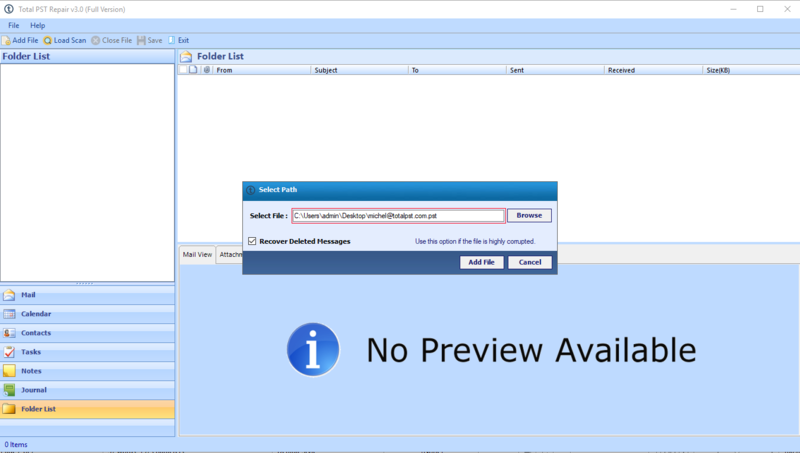 You can easily perform recovery of large Outlook PST file tool does not impose any size restriction. PST repair utility allows the user to repair corrupted PST file & restore all recovered data into new PST file which is accessible into Outlook 2016, 2013, 2010, etc editions. Quick recovery for pen drive recovery software is developed to recover usb deleted files from formatted pen drives. Best Pen Drive Recovery Tool easily restore pen drive data even after files&folders deleted by using shift delete keys.